Invented in 1986, and marketed as Cosmosis by Ben Harris, this effect has become one of the most pirated close-up creations in magic's recent history. It truly has become a "classic." Even today, twenty-three years after its debut, unscrupulous individuals and manufacturers in many countries market it without any due respect for its heritage or compensation for its creator. From street stalls in India and across Asia, to the high streets of London and Paris, you'll find this effect ripped-off and offered to the casual purchaser. The inventor now offers all the intimate details of this examinable micro-illusion in digital format. This edition has been specially prepared as an "Authorized Download." This contains all the information you need to make this a miracle levitation. You'll even fool those who think they know how it's done! Start Floating Today! Tenyo in Japan have released a version (with full permission) that uses a little broomstick. Gloriously produced, this appears as an entry in their "World's Greatest Magic" series. The broomstick makes this a great Harry Potter tie-in. 1st released 1986; digital edition 2009; 26 pages. 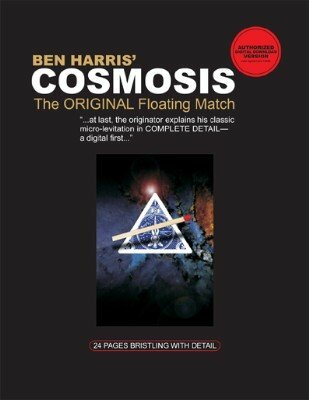 Cosmosis is one of the effects that I have previously owned before the Digital version was released. This is an effect that I believe we can all relate to. This is one of the best selling effects around the world with companies everywhere ripping it off. It’s literally everywhere. Even one of the best selling commercial magic companies Marvin’s Magic reproduces this classic effect. But, learning the effect from the original source is bar none, the best way to learn an effect and now that this eBook is more available to magicians, I really hope people pick it up and get the original inventors insight into this wonderful creation. Admittedly, the first version of this that I owned was in some kind of children’s magic set and it was not until I purchased Ben’s Cosmosis about 3 years ago that I realised how historic this creation really is. To those who do not know this classic, all you have to do is go into YouTube and type in Floating match to see just how popular this effect is, boasting thousands of videos from children and adults alike. From the professionals to the hobbyists, it seems to cover such a vast market of people from all over the world. The effect in its simplest form: Two cards are selected from the deck. A wooden match is introduced and is set on the back of one of the playing cards. The match then hovers over the card and the second card is passed beneath it to prove nothing is holding it up. The match hovers back down and it is handed out for inspection. So firstly, we sift through the 5 or so pages of copyright agreements. However, this time we have a couple of images to keep us amused on our way to the introduction. Again, the introduction has been rewritten for the release of the digital book. The quality of this eBook is fantastic. Sleek, simple and easy to navigate through. The introduction really brings home just how much this effect has gone through and how much Ben has been forgotten through the various pirated copies that have been made through the years. Ben goes over the various thoughts behind the trick and also informs us of an authorised version of the effect that uses a small broomstick. Very fun indeed. What I find most interesting about this effect compared to the marketed card versions is that we can pay up to £15 for two premade cards. In Ben’s original Cosmosis, not only does he teach you in depth how to make the cards at home, but also how to acquire the right props and things to use. Meaning you can make hundreds of the gimmicks for about £2.50. This really shows how much these rip off versions really do rip us off. Ben’s thoughts throughout the book are worth every penny and almost make me feel guilty at ever looking at another version of the floating match. The whole book is fantastically well written with many clear, artistic photos which help greatly when making the gimmicks. Everything is taught in depth and so careful is Ben to make the book last throughout time, he seems to have re written some of and re edited some of this book exclusively for the digital download. I feel as if I must thank Ben personally for this effect. An effect that I believe we have all played with at some point and one that most of us will never forget. I’m glad I have had the chance to learn it from the original creator of the effect. This really does rival any of the premade versions on the market. What would you honestly prefer? To learn how to make the gimmicks for a lifetime and for next to nothing as well as gaining priceless information on the effects origins and learn from the creator, the inn’s and out’s of the effect from start to end or to buy pre made cards for triple the price and without the original critical workings that make the effect so strong. I know which I would prefer.